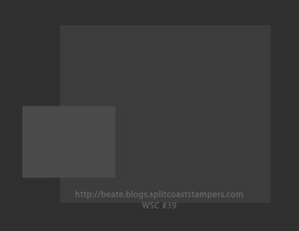 Hopefully, I've successfully attached a Microsoft Excel (ETA: Word document) file below of the blank Copic Color Chart I use (shown in the post below) -- thanks to Marianne at Copic! 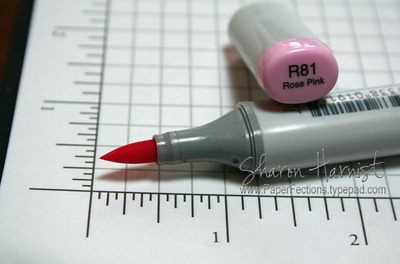 This blank chart is for you to color in with the markers you have, so you can easily reference it. If you have any problems downloading the chart, just leave a comment on this post and I'll try getting it to you in another way! Edited to add: I've had some good questions from readers, so I thought I'd share this additional information. 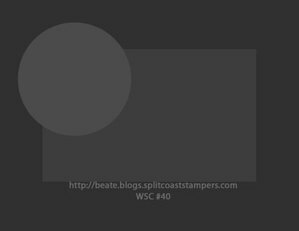 You probably want to print the chart on either Georgia Pacific (from WalMart) white, Papertrey Ink's white, or Neenah Classic Crest white . 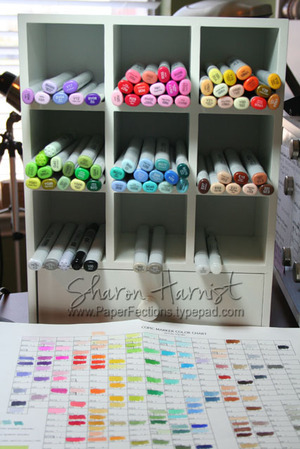 . . basically any cardstock that has been found to work well with the Copics and that you would normally use with your Copic artwork, so you get the truest representation of the colors. Usually, the printer ink won't smear with the Copics. The chart you saw in the photo below was one I got from the U.S. Copic distributor at my Certification class (more on that below) and was printed on 11" x 14" plain copy paper. If you have the larger size of paper option to print on, I would also suggest that and you can just adjust the file printing size in the print que to "Fit to size". A larger size might be a little easier on some eyes. Some of you have asked about the Copic Certification class I attended in January. 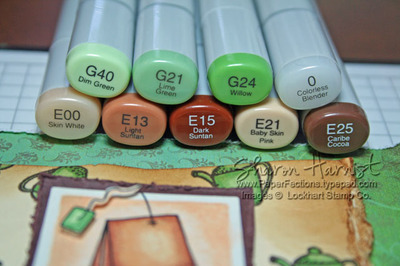 Copic now has a list of their upcoming certification classes posted on their website here! 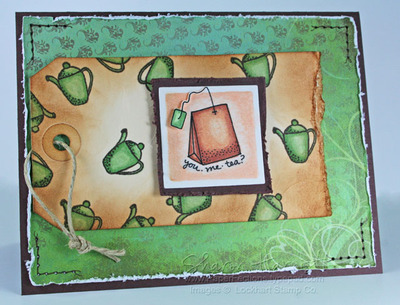 What a fun idea to visit some new/different blogs of those participating in Papertrey Ink's new monthly Blog Hop challenge! You can read all about it here. Since I love a challenge and an idea immediately came to mind (love when that happens! ), I decided to participate. Welcome to any of you PTI fans who may not have visited here before. You can find my entire PTI photo gallery/album over on the right sidebar of my blog (scroll down a little). A list of all the participating bloggers in this month's challenge can be found at 8pm EST in the PTI Blog Hop Forum, so check there for some more links to this month's projects (if that link doesn't work for you, you must be a registered user and logged in). 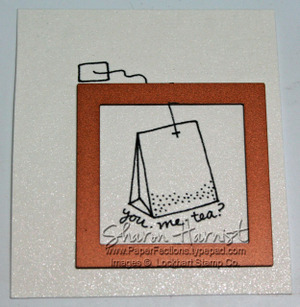 I started by cutting a piece of Papertrey's Stamper's Select White Cardstock to 4-1/8" x 5-1/8" (finished card is standard A2-sized: 4.25" x 5.50"), putting adhesive on the edges and wrapping 8 strips of PTI's new Perfect Match 5/8" wide grosgrain ribbon (Berry Sorbet, Spring Moss, Sweet Blush & Aqua Mist,) around it. 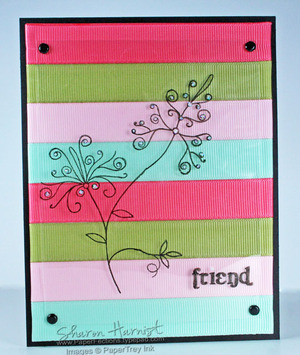 Then I stamped the Spiral Bouquet images and "friend" (from Beautiful Blooms) with Palette Noir ink on one of the acetate sheets the clear PTI stamp sets come on (nothing like recycling)! I hope you enjoy the blog hop and come back often to visit. I'm off to check out all the other participants' projects! If you enjoyed my project, I'd love for you to vote for it in the Blog Hop Voting forum by midnight EST tonight (Mar 25 -- #2411, towards the bottom of the list) . . . many thanks! 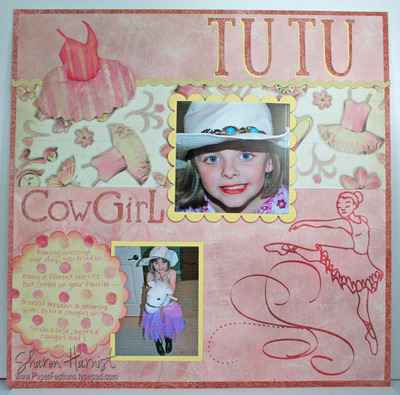 This is another one of my Spellbinders monthly gallery projects from last month, a 12x12 scrapbook page. You can click on that gallery link above and now see that most of the designers' artwork has been added. There may still be a few missing links and projects but still, a lot of new artwork to gaze upon! 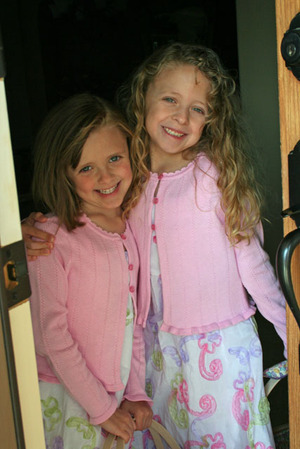 My youngest daughter LOVES to dress up, and concocted this wild outfit one day. 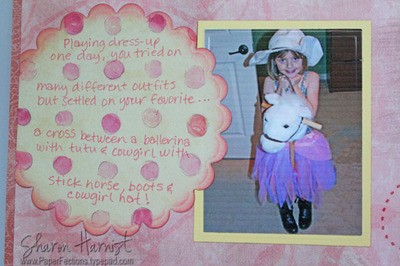 She started out first with JUST cowboy boots & hat and nothing else except underwear . . . I saved you all from that photo, LOL! So then she decided to put some clothes on and I guess the ballet tutu was the first thing she put her hands on. Stickhorse in hand, she was proud to show me her new outfit! 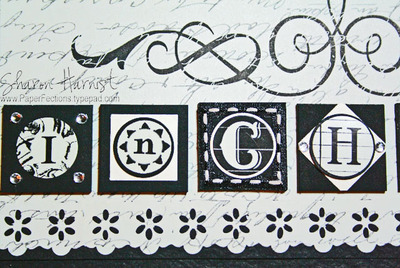 Products used -- Spellbinders S4-080: Ballerina, L3-01: Indulgence Upper Alphabet, L2-09: Julius Alphabet & Numbers, NEST-02: Nestabilities, Classic Squares (& Scallops set), NEST-03: Nestabilities, Classic Rectangles, S4-125: Nestabilities-Classic Scalloped Circle, Small. Scrappin’ Sports & More printed papers: #444-Live, Love, Dance & #446-Pretty Paisleys, Prismatics Cardstock #Y005-D Frosted Yellow, Fancy Pants Designs Sweet Pea Ribbon Collection-Yellow Rick Rack, Beacon Adhesives Fabri-Tac. 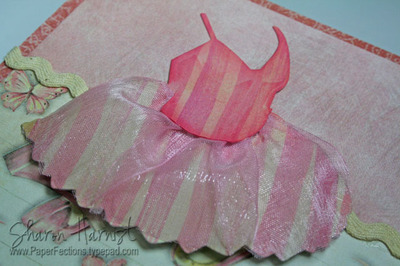 K & Co. Hopscotch Girl Flat Papers: Ballet Toss, Pink Stripe & Pink Dots. 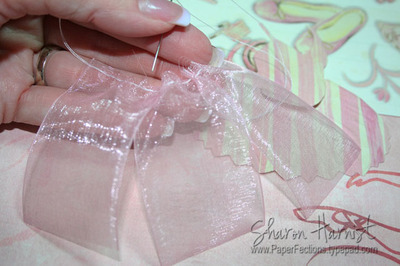 Michael’s Sheer Creations Wide Organdy Ribbon-pink, craft knife. I love this Julius alphabet I die cut the "Cowgirl" title with, using both upper and lower lettering . . . and those big baby blue eyes! 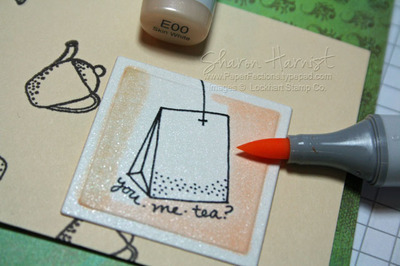 If you check back in later this evening (Tue, March 25 @ 5pm CST), I'll be participating in Papertrey Ink's new Blog Hop. 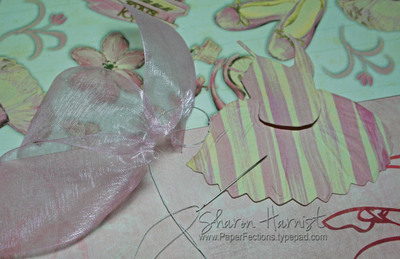 I had fun creating this month's challenge project using ribbon as the main focus! Sometimes they can be so sweet! I also had time to design a new blog banner and make a few other changes -- please tell me if you see anything askew or not working properly! The CPS layout was actually portrait but I had to turn it landscape to fit in this beautiful scene! The bird is stamped in Adirondack Pitch Black on Curious Iridescent Cryogen White shimmer cardstock (my fav!) and colored with Copic markers. 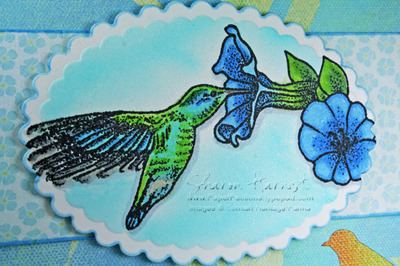 First, I airbrushed the background with Copic B00-Frost Blue while the image was still in my Spellbinders Nestabilities Petite Scalloped Oval die -- that will leave you with the white around the edges that looks like a mat. Easy Blending 101! I used this same technique for the bird and leaves as well. 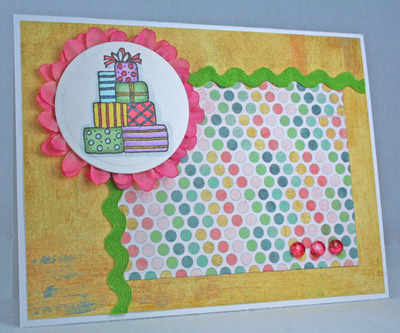 Next, I decided I wanted a little darker mat of color around my focal image, but not wanting to add any more layers that I didn't think would fit on the card, I decided to just outline the white scalloped edge with the B21 marker. 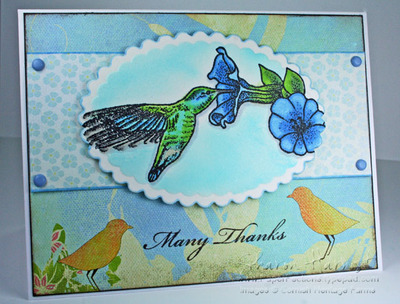 I also did this to the morning glory light blue paper underneath the bird image, just to make it pop a little more against the other patterned paper. Four Making Memories blue brads secure the blue strip of paper to the background and then I added the beautiful "Many Thanks" stamped sentiment in Adirondack Espresso ink, to match the brown in the printed paper. 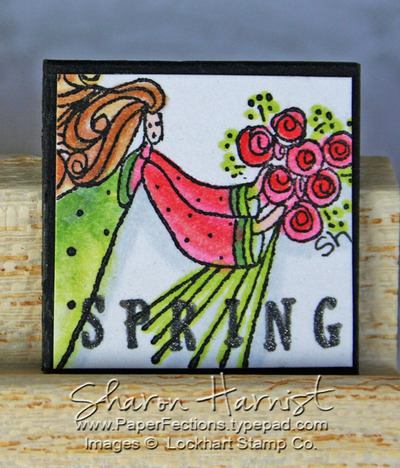 You can check out Asela's other new spring stamp releases here -- they are all gorgeous sets! Happy Easter! 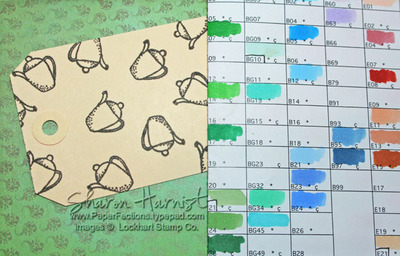 They both use Karen Lockhart's Packages -- what I really like about these is that by coloring them in different color schemes, you can have either birthday presents, wedding presents, baby presents, or Christmas presents -- whatever your heart's desire! (Both inks were heat set very quickly with my heat gun). 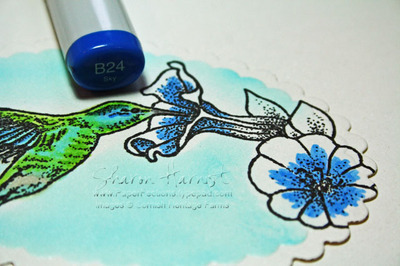 I found it stamped very clear & crisp and did not smear at all when coloring with my Copics! The focal image was mounted on some Heidi Swapp pink flowers and uses Doodlebug Limeade rick-rack (toned down and darkened a bit with the green Copic I used to color the presents). Poinsettia Dew Drops finish off this card in the lower right dotted panel, which was cut with Spellbinders largest of the Large set of Nestabilities Classic Rectangle dies. I could also see a difference in this pigment ink stamping a little more "thickly" (for lack of a better word) and thus, the image not being quite so clear or as many open spaces as the other image. Still, I'm sure I'll still be using this ink on occasion. 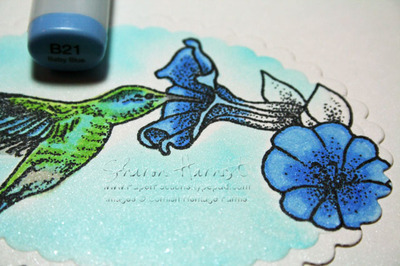 This card also uses some Doodlebug rick-rack in Bubble Blue again, darkened with a Copic marker and stapled with a mini-stapler on the right sides. 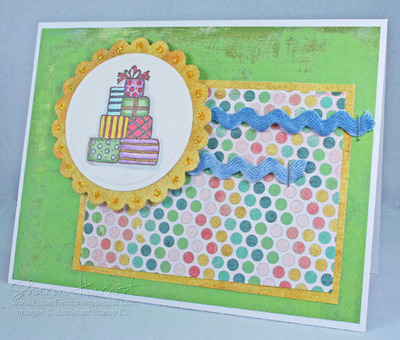 Yellow Stickles were applied to each of the Spellbinders Nestabilities Classic Scalloped mat. 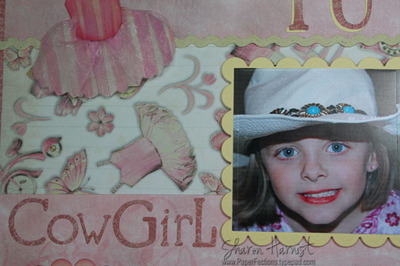 I hope you enjoyed this comparison and my cheery birthday cards and will check out these blogging buddies of mine, to see their samples: Cambria Turnbow, Charmaine Ikach, Jenn Balcer, Laurie Schmidlin, Lori Craig and MaryJo Albright. I hope you'll try this sketch this weekend and have a very enjoyable Easter weekend! This is another one of my first gallery projects for Spellbinders -- a shadowbox card I created, using these basic instructions. Measures 6" x 6". You can see in the top view of the photo below, how this card is constructed. Bottom butterfly and scalloped oval was created with the Out-Of-The-Box technique I detailed for you HERE. Butterflies & Doodle swirl were chalked with shimmer chalks. That's one thing I love about Spellbinders dies -- the stenciling option, which gives so much more dimension to your die cuts! 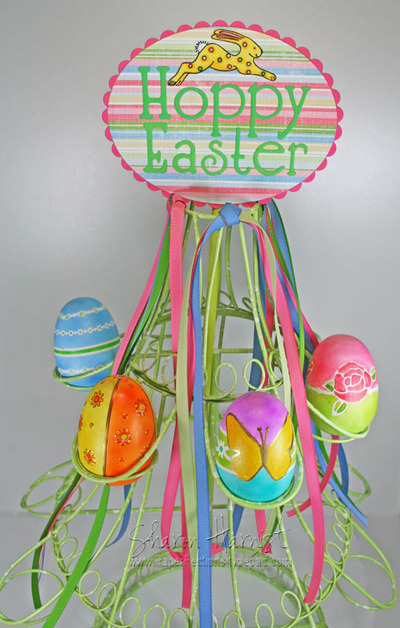 I hope you all have a wonderful Easter holiday this weekend! 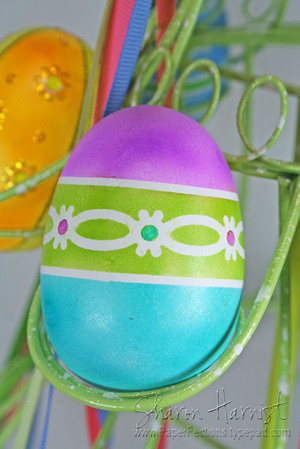 Today I have the rest of that Copic Airbrushed Easter Egg project I previewed for you last week. 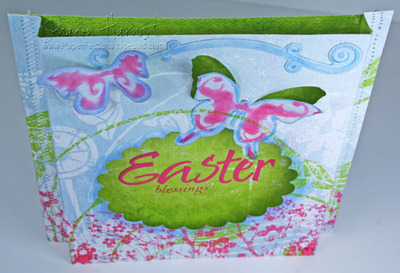 It was one of my first gallery projects for the Spellbinders website. (<== Hopefully by the time you click on that link all the new gallery projects will be up). You can check back there every month to see all the new projects the designers have created. After cutting the mask, I applied it and airbrushed different sections of color with Copic markers. After removing the mask, I colored in the white space the mask left with a yellow Copic marker and accented the butterfly with Krylon gold leafing pen . . . so much fun! That's Karen Lockhart's adorable Dottie Bunny -- she's still the Stamp of the Month at Ellen Hutson's store. 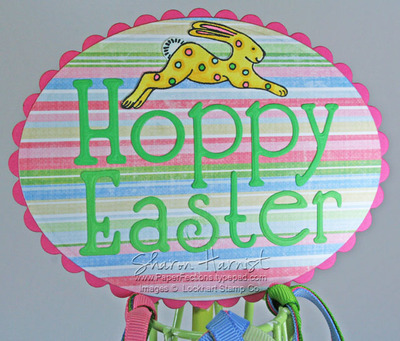 I know Easter is almost here, but wouldn't this bunny be fabulous on a baby card or nursery project? 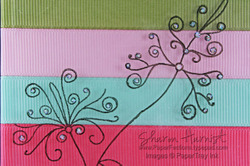 Patterned paper is by Fancy Pants (Sweet Pea-Noah), solid colors are WorldWin's Medium Grassy Green & Deep Pretty Pink. 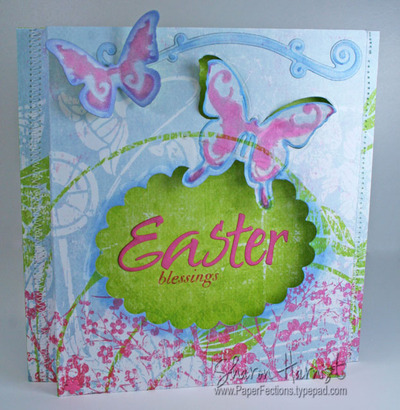 "Hoppy Easter" was die cut & embossed with Spellbinders Julius Alphabet. 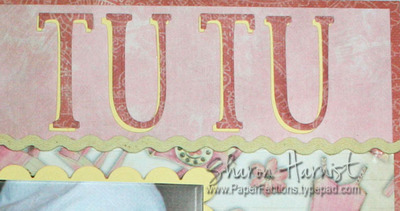 The oval "sign" is cut with Spellbinders Nestabilities Petite Classic & Scalloped Ovals. Grosgrain ribbon was knotted around the top of this holder, which reminded me of a pretty May pole or carousel! 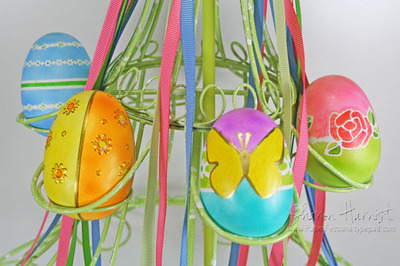 I hope you try out these airbrushed eggs for Easter -- please let me know if you do! 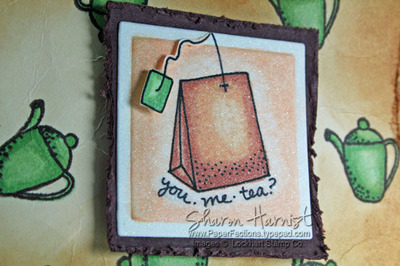 I'll be showing you two more Spellbinders projects between the Inchie ABC's this week, so check back in! 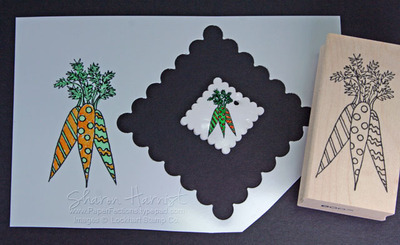 An Inchie challenge was issued amongst some of my blogging friends -- to see what we could come up with using Karen Lockhart's adorable new Spring Release stamps, Dottie Bunny and Organic Carrots. Typically, in the past I've used StazOn ink with shrink plastic, but I knew I wanted to try coloring these images with Copic markers and knew the StazOn ink would smear. So I used Palette Noir ink. Now for impatient people like me, it was tough having to let the ink dry over night! But since it still wasn't dry around 1am when I was doing this project, I decided to just call it a night and try again the next morning! So the actual drying time might be a little less than over night. Then I colored the images with Copic markers, still being a little careful not to touch very much of my stamped image. I'm pretty bad at math when it comes to calculating what 45% of a certain size will end up, shrunken -- those are what the instructions on the shrink plastic says your image will shrink to! 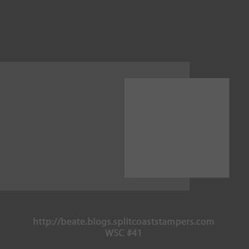 So I just grabbed a Scalloped Square Spellbinders Nestabilities die and hoped it might be the right size for an inchie, after shrinking . . . and I lucked out! The size I used here is the third smallest in the Large Set. That's the shrunk image in the center of the photo above, shown in the void of the shrink plastic where it had been. At the widest point, this die measures 2.25" and it shrunk to exactly 1-inch! I tried using the 1-inch shrunken square images from the first photo, but they just weren't as cute as these cut out ones! Still, Dottie shrunk to be 1-inch from extended paw to paw and the carrots are 1-inch tall! Don't forget to punch a hole in your shrink film before shrinking, so you have a hole to hang it by. So there's another letter for you in my Inchie ABCs - S is for shrink plastic! If you haven't seen my other Inchie ideas, just click on this Inchie Art link or in the Categories section on the upper right sidebar of my blog and Ellen has some fabulous ABCs of Inchies on her blog as well! Be sure to check out my buddies Cindy, Debbie, Michelle & Trudee to see what they came up with for this challenge and don't forget that Ellen is having a St. Patrick's Day sale in her online store tomorrow, Monday, March 17th for 17 hours -- 7am to midnight PST! You'll need the coupon code that comes in her new newsletter. If you haven't signed up for that yet, go to the bottom of her store's homepage and enter your email address and you'll receive the newsletter in time for the sale! Everything in Ellen's store is included on the sale, so now might be a good time to get one of those "Gotta Have It All" packages Ellen is famous for putting together. The sale also includes this month's Stamp of the Month kit which contains this cute little Dottie Bunny stamp I used above. Also included in that slick new newsletter is a tutorial for soldiering an adorable Inchie bookmark. I hope to try out soldiering something soon but in the meantime, you should see this fabulous teapot bookmark Cindy made, by using those newsletter instructions! Tomorrow and next week I'll be showing you the first projects I've made this year for the Spellbinders gallery website, so check back in! C is for Color and Copics! 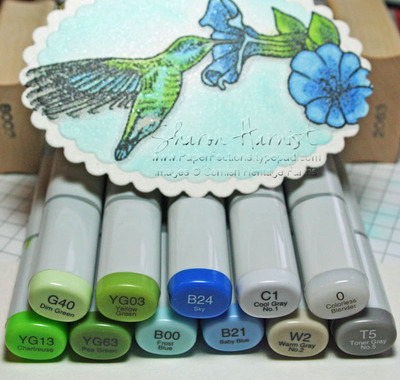 Copic markers are fabulous to add color to your Inchies. 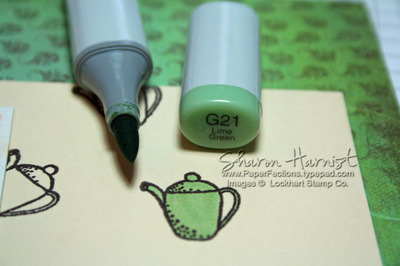 They are permanent ink that won't bleed or smudge -- a good thing to have on your Inchies since they are so darn cute and people will be picking them up to oogle all the time! Project details -- Lockhart Co Gardening Angel stamp, Karen Foster Snap Stamps (retired), Curious Iridescent Cryogen White shimmer cardstock, Copic markers & Spica glitter pens, black matboard Inchie square. C is for Clay, Cupcake! 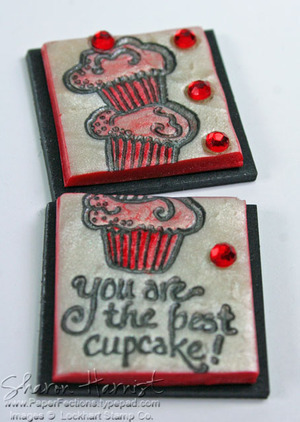 You can also use dimensinal clay product like Premo Sculpey polymer clay to make your Inchies. This type of clay hardens in the oven, so it's pretty quick -- no waiting over night or a few days for it to dry. I used a pearl color, so it has a shimmery cast to it (which is appearing a little more gray in the photo than it is actually). 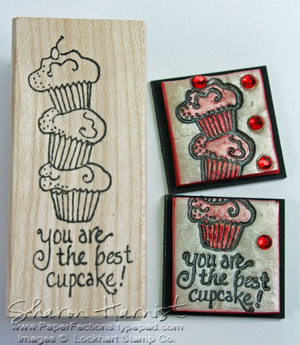 I just used the Lockhart Best Cupcake stamp shown on the left, stamped with Palette Noir into the rolled-out clay and then baked it according to the directions. I edged the clay with a red Copic marker and then adhered the Inchie clay to black matboard 1-inch squares and put strips of magnet on the backs. Now each of my girls each have a cute magnet to hang their artwork on the fridge . . . but you know they'll be arguing over who gets the most cupcakes -- oy! Check back in tomorrow, when my blogging buddies Cindy, Debbie, Michelle, Trudee and I will be havng a little Inchie challenge! 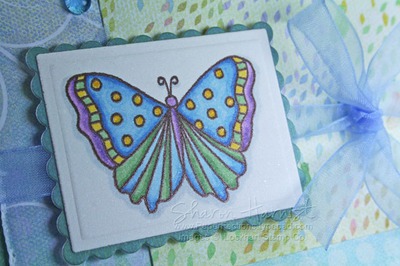 Products: Lockhart Polka Dot Butterfly stamped in Brilliance Pearlescent Chocolate pigment ink on Curious Iridescent Cryogen White cardstock, colored with Copic markers, cut and matted with Spellbinders Classic & Scalloped Rectangle Nestabilities. 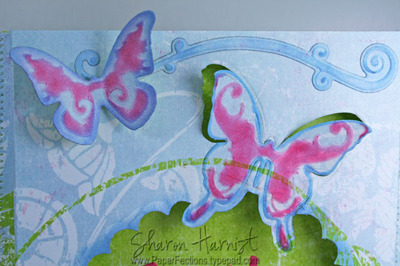 Clear Dew Drops (colored with same Copic B23 I used on the butterfly), Memory Box Aerial & Inspire printed papers -- all except white cardstock available at EllenHutson.com. 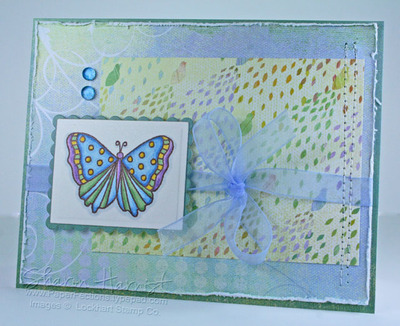 Tonic Edge Distresser, Pop-Up Glue Dots, Stampin' Up blue narrow organdy ribbon, sewing machine & white thread. 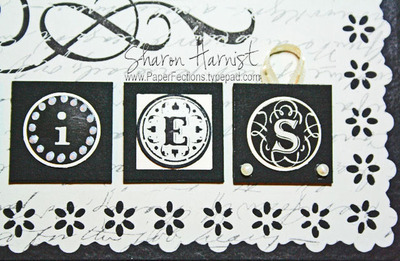 Be sure to check out my stampin' friends' blogs for their take on this sketch: Beate, Cambria Turnbow, Charmaine Ikach, Jenn Balcer, Laurie Schmidlin, Lori Craig and MaryJo Albright -- they'll be awesome, I'm sure! Join us on the fun this weekend and try out this sketch. I'll have some more Inchie ABCs for you tomorrow! 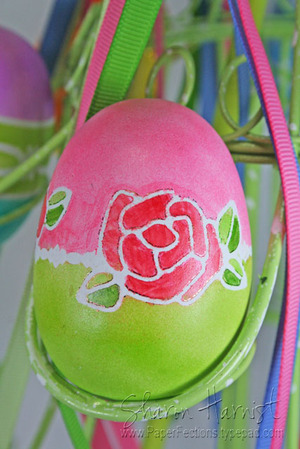 How about a little Easter egg fun? 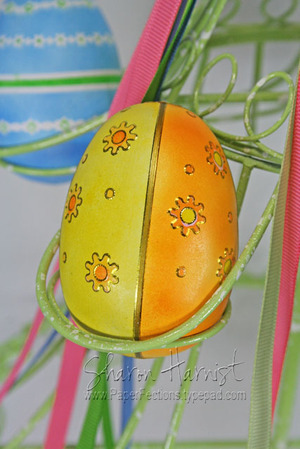 I saw this post over on Ellen's blog where she airbrushed Easter eggs with Copic markers and it reminded me that I hadn't posted some I made the end of last month! Our stamping minds were thinking alike! So here are a few I made, but you'll have to wait a until next week to see them all and the great egg holder I found and decorated -- they are a part of a project I can't share just yet! 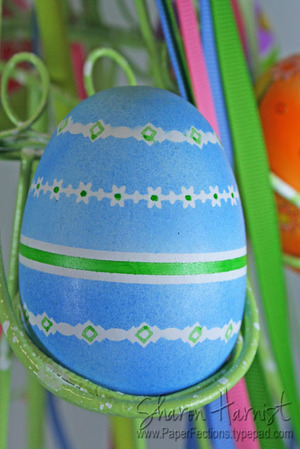 So basically what I did was apply scrapbooking line stickers on wooden eggs that were already painted white (from Hobby Lobby - 8 for about $4.99) and then airbrushed over the entire egg (in this case, blue). In some instances, I masked any other places I didn't want the current color I was airbrushing to color -- like the center stripe here. 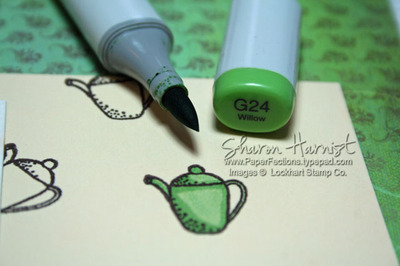 Then I went back and added accents with Copic's green Spica glitter pen -- it worked perfectly to add a little sparkle! Pretty simple, basic & fun! Remember, the Copic Colorless Blender Pen removes color, so I used it to remove the color in the flower centers and then color them in with a different color. The blender pen was also helpful in removing any color that might have oversprayed anywhere I didn't want it. 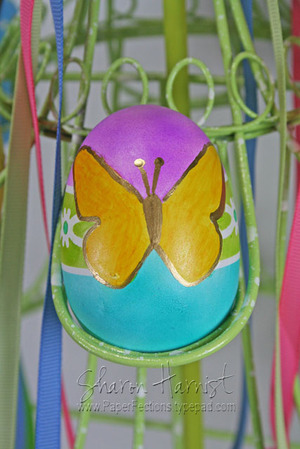 This last example was my favorite egg I did . . .
. . . I love the way this detailed rose sticker turned out as a mask! This one took a lot of additional masking around each rose to get the different colors on top and bottom -- there are three roses around the center. But Copic's airbrush system really lays down a nice, even, soft color. After all this work, I'm sure glad these eggs can be kept to use for years to come! 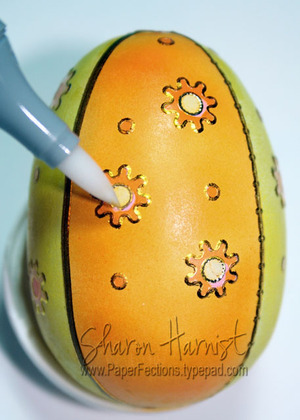 Be sure to check out Ellen's samples -- she actually stamped directly on a real egg! Be sure to let me know if you try these, so I can come check them out! 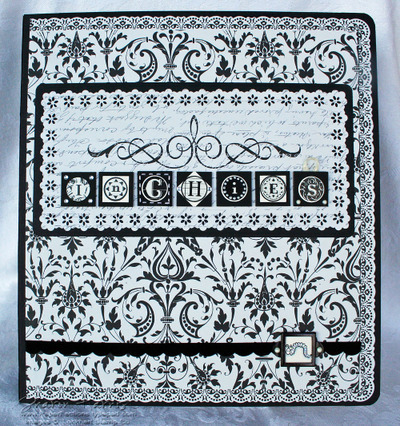 This special binder measures about 10.50" across by 11.50" tall, so it's easily covered by by a 12" sheet of patterned paper (mine is the Antique Cream collection by Creative Imaginations & Prismatics Black). It's made of recycled corrugated cardboard and the unique thing about it is that the inside spine with three rings can be taken out and the cover laid flat to decorate! This also makes it easy to switch out your covers, too, if you'd like -- seasonally for example. Above, I've added crystal gem stickers to the four corners of the "I" and two points of the "H". 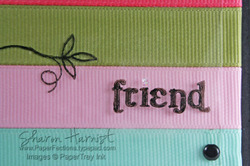 Stitched ribbon edges the letter "C". Below, Ranger Liquid Pearls gives Dimension to the letter "i". Flat-backed cream pearls were added to the bottom of letter "S" and a loop of cream stitched ribbon Embellishes the top. And don't forget about that little Inch Worm Inchie on the lower right side of my binder cover that I sneak peeked for you -- she's covered in Stickles glitter glue bling! 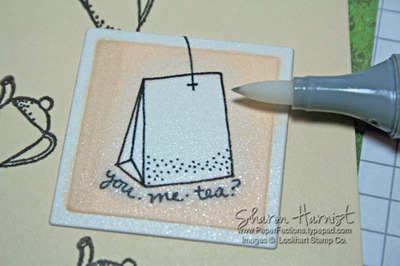 These black matboard 1-inch squares I'm using for an Inchie base makes it very quick and easy to create Inchies. They come in either black or white. 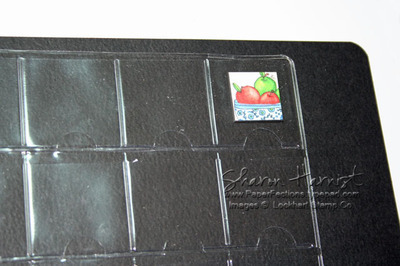 And if you want to get started on Inchies the easiest way, or haven't been able to find good prep or storage solutions for your Inchies, Ellen Hutson has a Gotta Have It All package. Keep checking in over the next few days, as I'll have some more Inchie ideas for you! 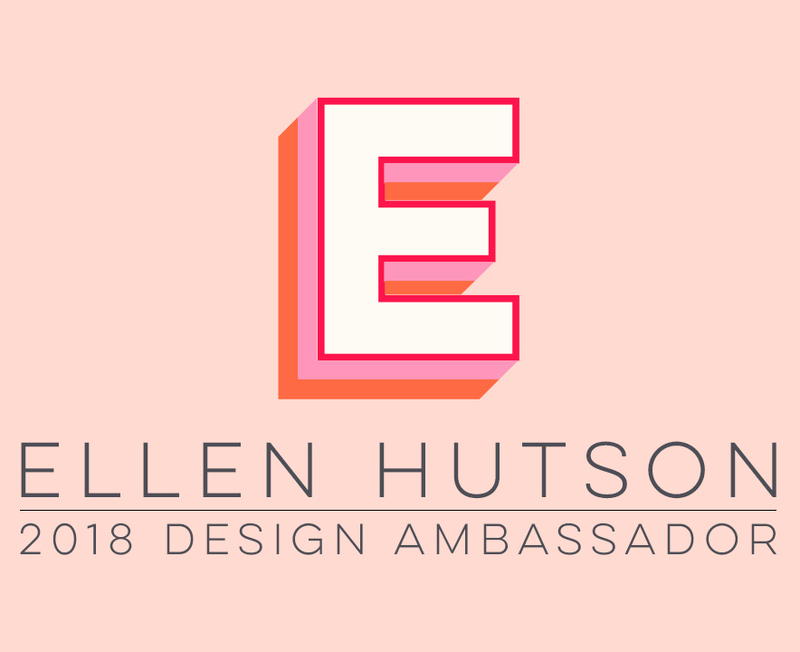 Have you received your first E-newsletter from EllenHutson.com? If not, you'll want to go to the bottom of THIS page to join her mailing list! 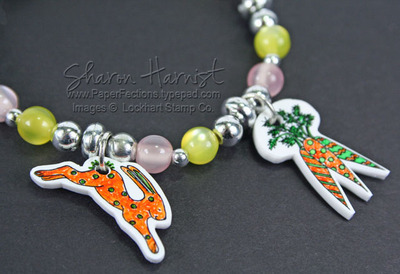 The newsletter has a great tutorial in it on soldiering your own book mark, which you can also apply to jewelry making. It's been about 10 years since I've held a soldiering iron Ellen's tutorial was quite informative -- I can't wait to try making something! The newsletter also has a coupon code in it for a 17-hour sale next Monday, March 17th in honor of St. Patty's Day . . . woo-hoo! Ellen also has her next letter of the Inchie ABC's up, so you'll want to go check that out! You'll read there about a giveaway that will start at 8pm PST (10pm CST) TONIGHT, when the link to all the new great products she'll have for Inchies in the store goes live. Ellen wanted to ensure that it would be fair to all her newsletter readers and customers that you would all receive the same chance at receiving the Inchies that she and Karen Lockhart have created to give away with your purchases (see details in newsletter). Remember the links will all become live tonight, Tuesday March 11th at 8:00pm PST. I'll be back a little later with my B part of the ABC's of Inchies!